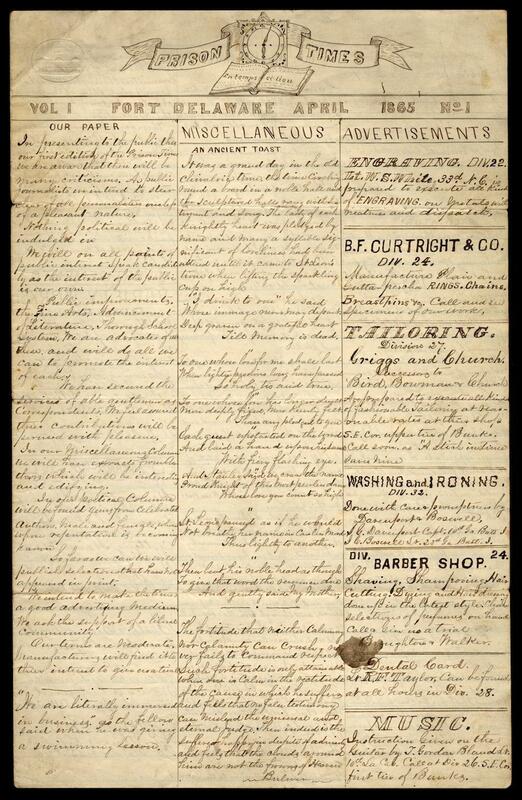 Confederate POWs: Produced handwritten newspaper at Fort Delaware. Confederate prisoners of war confined at Fort Delaware produced this newspaper by hand in 1865. The New-York Historical Society holds one of four surviving copies, each of which was likely passed around and read by multiple prisoners. The paper numbers four pages in total. The “ancient toast” printed in the central column refers to “the old chivalric time.” Southerners before and after the Civil War were particularly intrigued by chivalry, knighthood, and the literature of Sir Walter Scott, and this offering reflects that taste. The newspaper also carries paid advertisements for barbershops, “washing and ironing,” dental services, and music instruction. If the first issue is any indication, the editors had no problem finding prisoners willing to underwrite this venture with their advertising dollars. Historian Harold Holzer, who wrote about this newspaper in the book The Civil War in 50 Objects, surmises that this edition of the Prison Times was probably one of very few produced. Vol. 1, No. 1 was “printed” the same month that the war ended. J.W. Hibbs, Geo. S. Thomas, Wm. H. Bennett, A. Harris. Prison Times, 1865. Four-page manuscript newspaper, 12 1/4 x 7 3/4 in. Misc.MSS.Fort Delaware. The collections of the New-York Historical Society.